For the artist, see Jennifer Nelson. 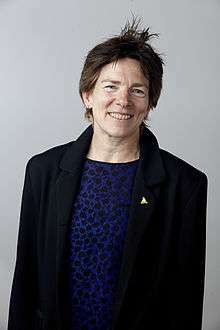 Jenny Nelson FRS, is Professor of Physics in the Blackett Laboratory at Imperial College London. Nelson's research is devoted to characterising the materials used to build and improve photovoltaic devices, which convert energy from the Sun into electricity. She applies a range of tools that include physical models, simulation and experiments to optimise the performance of such devices through their composite materials. Over the last twenty-five years, Jenny has worked with many types of energy converting materials, ranging from molecular materials to inorganic materials such as nanocrystalline oxides, and organic–inorganic hybrids. She uses information describing the electronic, optical and structural properties of these materials to inform the design of her devices, an approach that has garnered strong interest from industry. Since 2010, Jenny has also been studying the potential of photovoltaic technologies to reduce the amount of carbon dioxide that is emitted during the generation of electricity, lessening the impact on climate change. She is the author of a popular textbook, The Physics of Solar Cells. Nelson research has focused on the development of detailed physical descriptions of novel nanostructured or disordered (organic electronic) materials, the quantitative validation of model results against experimental data, and above all, the application of physical science to address the challenges in energy supply, in particular, in the area of photovoltaic energy conversion. Her work on the functional understanding of organic photovoltaic materials and devices has been her focus since 2000. Nelson is ranked by the Institute for Scientific Information as one of the top 100 materials scientists in the world on the basis of the impact (citations per paper) of her journal papers published between 2000-2010. Nelson has also been awarded a Greenpeace Research Fellowship 1989-1992 and 1996-1997, EPSRC Advanced Research Fellowship 1997-2003, Joule Medal and Prize, Institute of Physics (2009), Armourers and Brasiers' Company Prize, (2012), Industry Fellowship, The Royal Society, 2010 - 2013. ↑ Kim, Y.; Cook, S.; Tuladhar, S. M.; Choulis, S. A.; Nelson, J.; Durrant, J. R.; Bradley, D. D. C.; Giles, M.; McCulloch, I.; Ha, C. S.; Ree, M. (2006). "A strong regioregularity effect in self-organizing conjugated polymer films and high-efficiency polythiophene:fullerene solar cells". Nature Materials. 5 (3): 197. doi:10.1038/nmat1574. ↑ Campoy-Quiles, M.; Ferenczi, T.; Agostinelli, T.; Etchegoin, P. G.; Kim, Y.; Anthopoulos, T. D.; Stavrinou, P. N.; Bradley, D. D. C.; Nelson, J. (2008). "Morphology evolution via self-organization and lateral and vertical diffusion in polymer:fullerene solar cell blends". Nature Materials. 7 (2): 158–64. doi:10.1038/nmat2102. PMID 18204451. ↑ Kim, Y.; Choulis, S. A.; Nelson, J.; Bradley, D. D. C.; Cook, S.; Durrant, J. R. (2005). "Device annealing effect in organic solar cells with blends of regioregular poly(3-hexylthiophene) and soluble fullerene". Applied Physics Letters. 86 (6): 063502. doi:10.1063/1.1861123.